U.S. churches are now costing taxpayers $71 billion a year. A new study says that tax exempt churches in the United States are costing its citizens $71 billion each year in tax breaks. According to the Secular Policy Institute, religious groups receive $35.3 billions in federal income tax subsidies and $26.2 billion in property tax credits. They also enjoy $6.1 billion in state income tax, $1.2 billion of parsonage and $2.2 billion in faith-based initiative subsidies. If religious organizations (ie. churches, synagogues, mosques, etc.) were taxed like for-profit agencies, it was found that this could generate upwards of $71 billion per year in tax revenue. 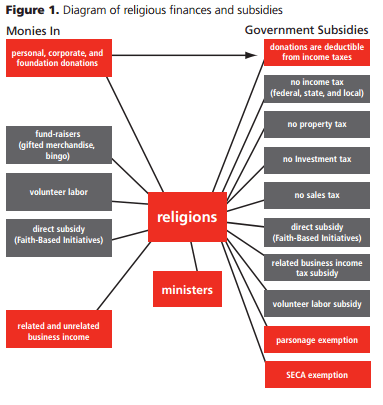 …even if churches were merely held to the standards of other non-profit agencies, this could generate $16.75 billion in tax revenue per year.The report estimate for the total subsides enjoyed by religious organizations, but they do not account for tax credits like sales taxes, local sales and income taxes volunteer labor subsidy, and donor-tax exemptions. Many Americans believe religious organizations require these heavy tax breaks for use in their charitable works. However, researchers at Secular Humanism report that many popular churches are in fact using far less of their funds compared to non-profits. The Mormon Church, for example, spends roughly .7% of its annual income on charity. Their study of 271 congregations found an average of 71% of revenues going to ‘operating expenses’…Compare this to the American Red Cross, which uses 92.1% of revenues for physical assistance and just 7.9% on operating expenses. The authors also note that Wal-Mart, for instance, gives about $1.75 billion in food aid to charities each year, or twenty-eight times all of the money allotted for charity by the United Methodist Church and almost double what the LDS Church has given in the last twenty-five years. While some churches actually participate in charitable works, they do not perform half as much humanitarian aid as a true none-profit organization.